The following drill was done in our training session on Monday after the game against Sturm Graz and before the last game of the year against Rapid Wien. For the session the team was divided into two parts. One group with players that played on Saturday against Sturm and only did regeneration and another group of 8 players that didn’t play and therefore were fresh. After a short warm-up with the fitness coach the session was started with the following rondo variation. Three zones were set up according to the image. In one of the three zones a 4vs2 is played, in the other two remaining zones there is one supporting player each. Starting from the 4vs2 the players have to pass into one supporting player in another zone by using two touches maximum per player. Obviously it is also allowed to played one-touch, which should be even encouraged to make use of lay-offs to a the third man. 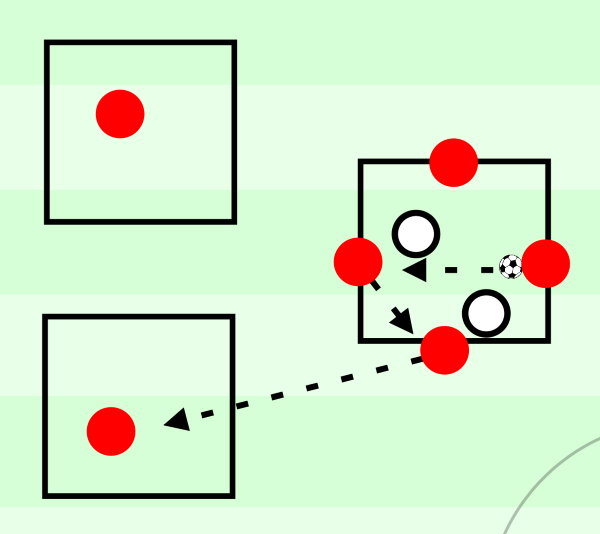 Two players from the 4vs2 have to follow the pass and also the remaining supporting player has to move towards the new ball possession zone to recreate a 4vs2. The defenders have to follow and try to win the ball in the next zone. The goal of this basic rondo variation is to stay in possession, create diagonal passing options, take care about the body position, improve the perception and to constantly change the point of the attack. The possession players should try to play away from pressure and then to move up or stay in position, which has to be done by goal-oriented short passing, optimal positioning and pre-orientation. In the new zone the players have to quickly oriented themselves again and to take care about the diagonal positions. They should use a body position that allows them to permanently see the two targets players/target zones, glimpses over the shoulder and an open position are key to achieve this. The defenders should try to close passing lanes and guide the ball in order to create numerical equality or numerical superiority in specific zones. It is important that the two defenders coach each other. The specific defending depends on how the team wants to individually and team-tactically defend and win the ball. As a variation there could be a set number of passes that has to be achieved in the 4vs2 before a switch to another zone is allowed. To improve the difficulty of the drill an extra defender to guard the space between the zones could be installed.